This chapbook is an insignia of a veteran poet’s sincere love towards a young poet. 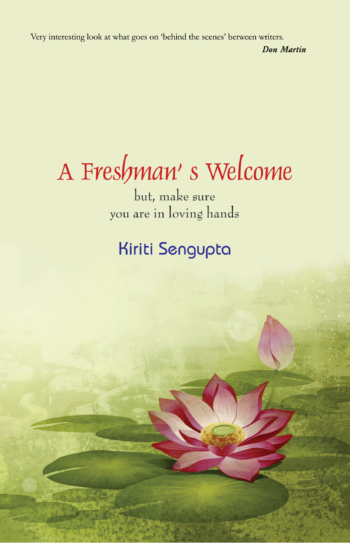 In short, A Freshman’s Welcome emerged from a speech, written by Sengupta to express appreciation for another poet’s debut book of poems, Heights of Life. But once the speech got curated in a book’s format, this can well serve as a note of encouragement for the young and aspiring poets that they can make it to the helm through this path of an elusive genre that they have themselves chosen. This is not an attempt to glorify anyone’s poetry, rather an honest tracing of the path that one has to take towards the publication of one’s first book of poetry. This makes A Freshman’s Welcome unique and an honest guide to the publishing world that is somewhat hard to find otherwise. The encouragement of mature writers who have established their name in literature is something we must not overlook. It seems rare that a poet would reach out to lesser known poets to firmly pull them up the rungs of the ladder. Many writers will advise the public about their craft through books, and speak candidly about their struggles. We do not hear stories of those writers who extend themselves freely to those they admire below them—because, honestly, this is a rare trait today … In A Freshman’s Welcome, the intentions of our noble dentist are again revealed in its epigraph: “Thou shalt love thy neighbor as thyself.” The craft of writing is one of the deepest forms of brotherhood, and writers pursue this noblest profession with only small amounts of appreciation.